For the past month, I’ve been hoping I wouldn’t find myself writing this post. However, after four weeks of technical consultation, today I received a text message that made my heart sink. All of my digital media has been lost. A major component to my digital studio is my external storage device. 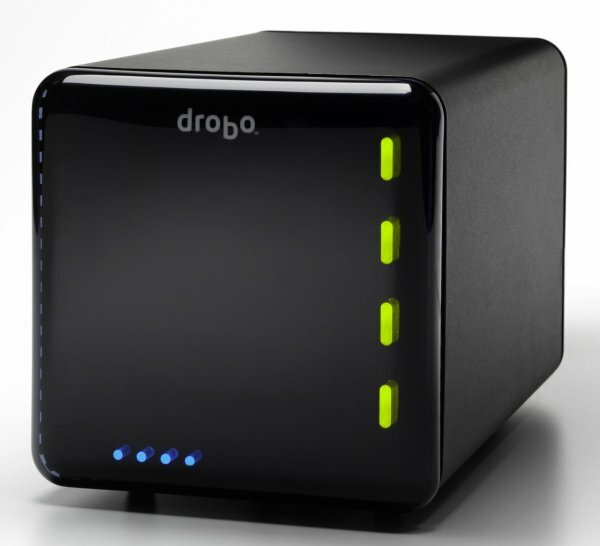 I use a product called Drobo. 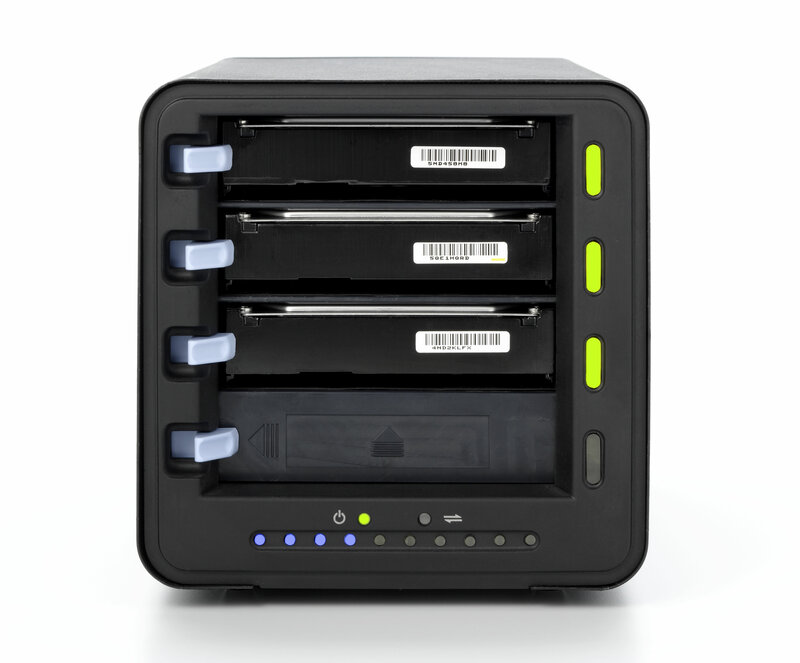 The Drobo unit I have is an older model and holds up to four hard drives. It chains those drives together so that they act as one giant super drive. But, the real benefit to using the Drobo is that it backs-up all the data stored on it by saving the information twice, spread out across all the drives. Another huge perk is that the Drobo safely warns you when one of the drives starts to fail or becomes full. A yellow light turns on indicating which drive needs to be replaced, and allows the user to simply pop that drive out and pop in its replacement without missing any production time. Pretty slick. 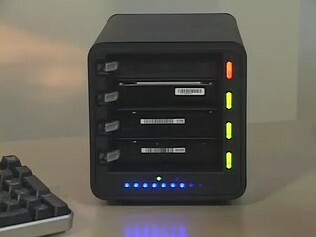 Another great feature of the Drobo is that it allows the user to mix and match different size drives. So as your data accumulation grows, so can your storage capacity. When I started out composing music for my film and video clients, I only had two 1.5 TB hard drives in the Drobo, 3TBs total of raw storage. Since Drobo spreads out the data twice, that actually gave me access to only 1.5 TBs of space. As my library of music samples grew, I added bigger drives into the machine. The latest drive configuration I was using was two 1.5 TB drives combined with two 2 TB drives, totaling 7 TBs of drive space, 3.5 of which was usable. If you tuned out the numbers portion of that last paragraph, no worries. To sum up, I had a decent amount of space, and it was all backed-up inside the Drobo. The key word being had. Five weeks ago, a yellow light lit up next to one of the smaller drives. I was running out of space. With the gallery show coming up in November, I had been traveling around the area, taking new In A Place photographs with our new digital camera. (You can probably see where this is heading.) With the influx of new, large format images being imported to the Drobo, space was being eaten up fast! I bought a 3 TB drive to replace the yellow 1.5 and popped it into the Drobo. The machine went to work, distributing the data to keep it all safe while giving me access to the bump in storage space. I’ve done this three times prior, and more or less knew what to expect. 48 hours went by, and the Drobo finally restarted. Usually this is when the whole machine reboots, and four indicator lights give me the all clear signal, a row of green lights assigned to each of the four hard drives. The Drobo went into an endless reboot cycle. And each time the Drobo restarted, a red light indicated that one of the other “healthy” drives was not feeling so healthy anymore. A day went by, and the system didn’t recover. During the back-up process, one of the healthy drives went critical. Since the Drobo hadn’t completed distributing the data when the drive failed, all the drives were stuck in a back-up limbo. Nothing was accessible. The service technician described the steps I could try to recover the data. Buy a new duplicate hard drive, same model and size as the drive that failed. Somehow clone the bad drive onto the new one. This meant copying the information piece by piece, bit by bit, from one drive to the other. Pop in the cloned drive so that Drobo wouldn’t detect the difference, and could then continue with it’s back-up. This was/is well beyond my level of computer proficiency. So I asked for additional help. Calista and I brought in an experienced computer technician to help with the cloning process. After an evening here at the house, attempting to get the cloning process started, he decided to take the drives with him and use equipment he had available back at his home. He was determined to make this work. Every single digital photograph I have ever taken. Family, Vacations, Kitsune, my years living in San Francisco, living in Toronto, Japan, College, FX Make-up gigs, pretty much every life event from 1996 to 2013. Also, every single music file I have ever written, including all the files for my two current music projects, The Unsound Symphony, and The Machines that Howl Growl and Wail. And yes, every single image taken for In A Place, seven years of miniature picnic table scenes, including the book files, the special edition prints, the digital layout for gallery shows, and all of the behind the scenes files, safe and sound on the Drobo. Today, I received the text message that made me face a new reality. Our technician wasn’t able to create a clone of the failed drive. Frozen in some back-up limbo, all of my data is essentially gone. That is, all of it is probably gone in direct proportion to the amount of money I’m willing to spend chasing an answer to the contrary. So, yeah, it’s all gone. I’m still a creative person. And new projects will come. I think about all the people who lose so much more when their home is destroyed, or when their dearest loved one(s) pass away or are taken from them. Terabytes of electronic information simply don’t compare. I’m heart broken, no doubt there. But, in perspective, there are bigger things in this world. My question is, do I return to projects that are now gone, recreate the work that I felt was strong? Not as easy a thing for me to do in regards to music. My process is purely inspired energy and I’ve never been able to duplicate something I’ve previously written. Yet, something new does get written. Right place, right time. In A Place is the real tough call for me. When I finished the book last year, I felt I had said all that I wanted to say with the project. Promotion of the series inspired new and fun discoveries of IAP locations. Yet, with all of that now gone, I don’t know if I have the curiosity to go back to the beginning. I would much rather take the techniques I’ve learned and apply them to completely new ideas. It hits me hardest when I think about all the time and energy that went into creating the book. Calista’s enthusiasm and sacrifice in being my project partner. Sherry’s hard work and knowledge in editing my words enough to keep the book energized and thoughtful. Alistair, Tyler and Justin who also went along on my IAP adventures, often at great physical peril. Well, peril’s a strong word. But they could have been doing more productive things rather than hike around in 100° summer temperatures, watching me take hundreds of photos in one specific location in an attempt to land a great picture, not to mention earn the perfect sunburn (sorry about that guys). In A Place was the biggest art project I’ve ever tackled. It was seven years of discovering my creative voice, ten years if you count the first time I used the picnic table motif. I could spend a whirlwind year, dedicated to earning a new series of images, but the majority of the locations that made IAP so special for me are now gone, eroded by time or replaced by urban growth. New places are certainly out there to be discovered, but maybe not through the viewfinder of a digital camera. In A Place taught me the importance of taking time to look with my eyes. For that, I am forever grateful. Which ever path I decide to follow, it can only be forward. There have been, and always will be, days when projects simply don’t excite me, and days when they are all I can think about. I just need to make sure I have a better solution in preserving what I love, and loving what I do.